I get asked a lot of questions when I wear my baby out and about. 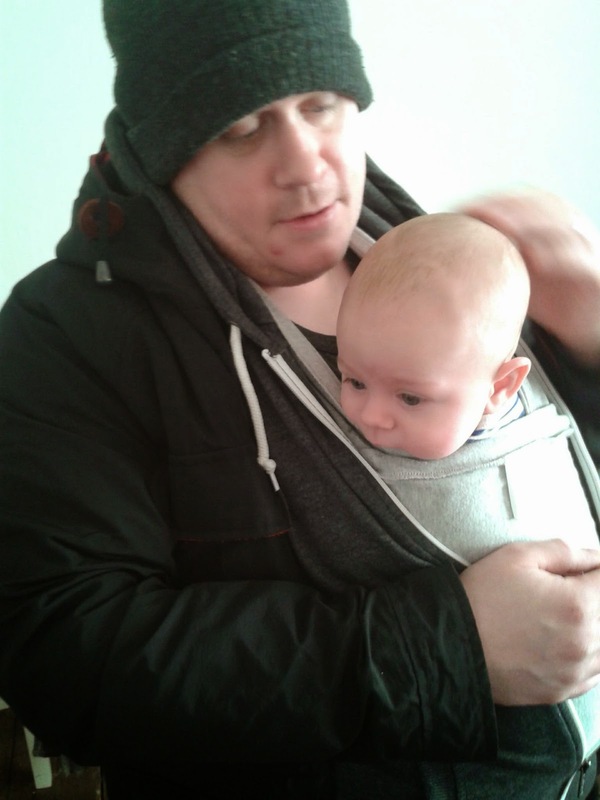 The sling is our default mode of transport now, I have a few different types and feel like a bit of sling expert. But this wasn't always the case. When I was pregnant I researched baby wearing. To be honest you can read and read and still not have a clue, so we decided I needed to try out the slings in person. We loved the caboo so much when frog was a newborn. He felt so snug and safe with his feet supported in the frog position. It also looks really good. 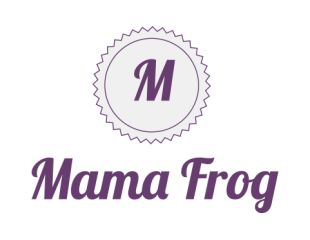 Now he's a bit older (8 months) I use a hand me down meitei, which is really easy to strap a wiggling cruiser on to my back so I can get on with chores.Mr frog has his own too. I've even made my own sling from a scarf that's still wearable its for use in case of emergencies, ie when mr frogs taking his sling and we need back up. It was created on a day we went out without a sling or a pushchair and works great. 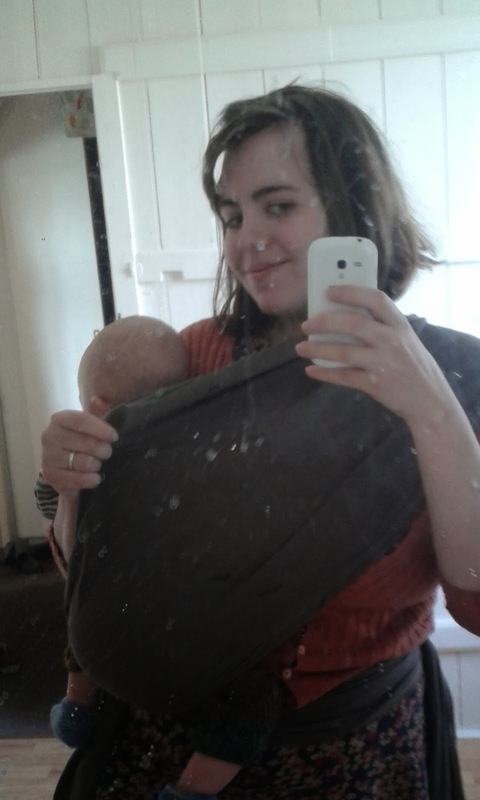 In fact I use my sling instead of my pushchair 95% of the time, I feel that confident about the safety. For those still apprehensive why not read what babywearing international has to say on sling safety.
" Babywearing International would like to remind caregivers that using a well-constructed carrier and proper babywearing techniques are of utmost importance when wearing an infant. Wearing an infant is a very safe method of carrying an infant, but we encourage parents to be informed on proper infant positioning.Babywearing can be just as safe as, or safer than, carrying a baby in-arms. 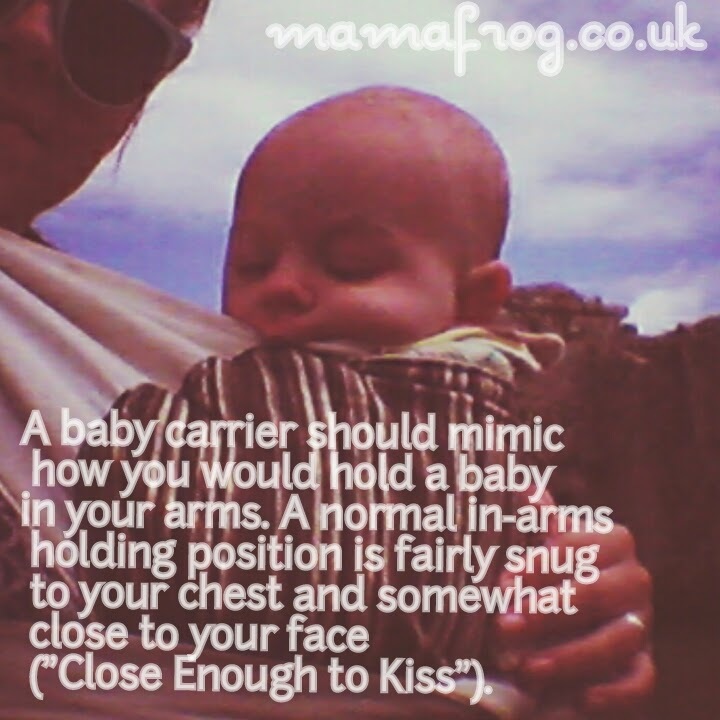 Slings and carriers do not have muscle fatigue and are a wonderful option for transporting a wiggling child. "Slings are wonderful parenting tools when used properly and safely," said Dr. Lois Balster, a pediatrician and a member of BWI's board of directors. "Using a sling incorrectly is not unlike using an infant car seat without proper installation, infant positioning, and restraints. It is always important to position your baby safely in any carrier or infant-carrying device. "A baby carrier should mimic how you would hold a baby in your arms. A normal in-arms holding position is fairly snug to your chest and somewhat close to your face ("Close Enough to Kiss"). 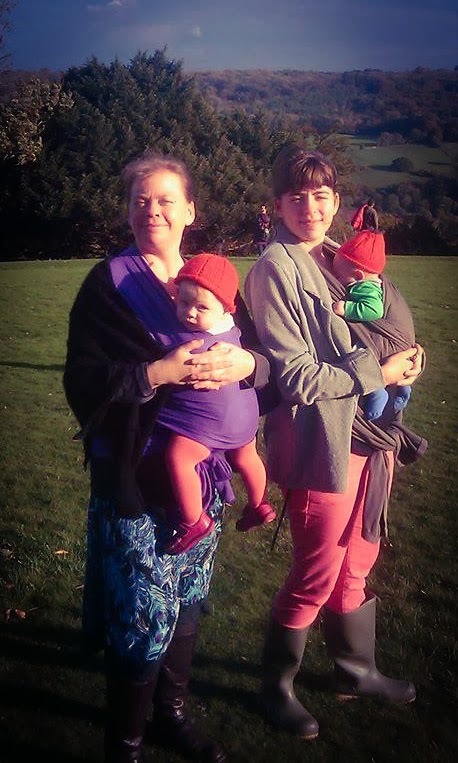 Babywearing advocates have been teaching about the importance ofcorrect newborn positioning for years and warning against the use of slings that do not allow for safe wearing positions. Check to ensure that your baby is not curled up tightly in a chin-to-chest position; this compresses your baby's airway. Making sure there is a fingers' width or two between their chin and chest is a good guide.Make sure your baby's back is straight and supported. Monitor your child at all times. Make sure nothing is obstructing their face.Be aware of how your movements affect the baby: avoid any bumping or jarring motions.